The Rogues have always been the best part of the Flash, for me. I started reading the series back when the Top died, and the rest of the villains gathered for his funeral. While each of the villains felt pretty much like a one note character on their own, together they formed an entertaining band of squabbling misfits, and often a real challenge for the hero. Williamson and DiGiandomenico launch a story that brings these characters back in this issue. One particularly nice touch shows the Rogues as they looked back in the old days, before advancing them to their current appearances. 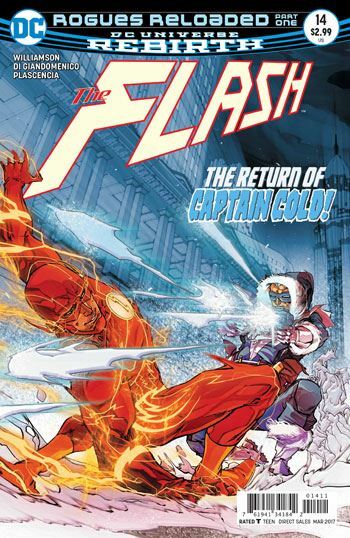 Captain Cold gets cover featured, and is joined in this tale by Heat Wave, Glider, Mirror Master, Weather Wizard and the Trickster. 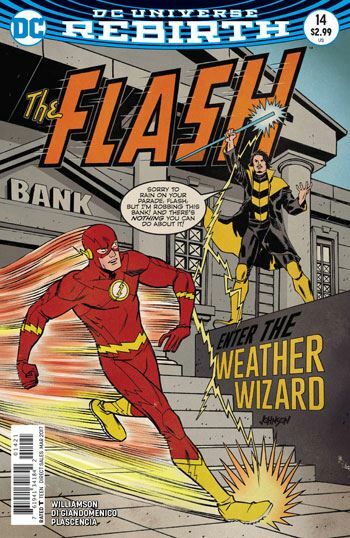 The Flash learns that the Rogues have left Central City, and much of this issue is devoted to his quest for them. To my endless delight, one of the people the Flash questions is Gambi, the tailor to the Flash villains, and a character who never seems to get enough page time. The Pied Piper, now reformed, also gets a cameo, which leads into the a well told recap of the lives of the Snart siblings, Captain Cold and Golden Glider. Though only a page or so, the recollections of Lisa Snart’s skating coach add a lot to the complex relationship the two of them have. Some subplots are set up or advanced in this tale. We meet the new warden of Iron Heights, ensuring that that facility will have importance in upcoming issues. And Wally West’s interest in his newfound father also promises to create problems down the line. When the Rogues are around, you know that the reader is in for a lot of twists and surprises, and this story looks to fill that bill quite nicely.